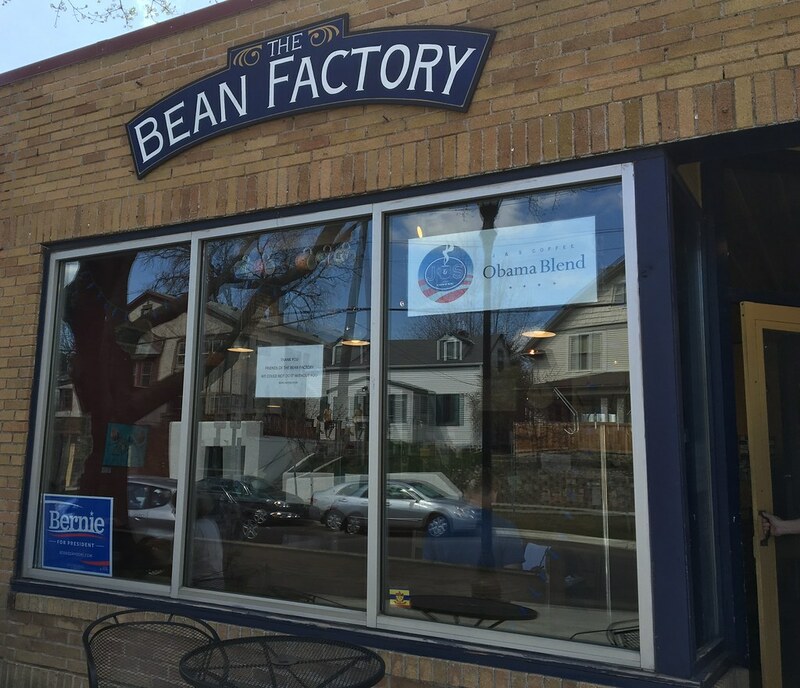 After finding J&S Bean Factory on a list of the top 10 coffee houses in the twin cities, I decided to give them a try. They're located in a sleepy, mostly residential area in St. Paul. Decor is meant to look a bit shabby (with areas of plaster ripped away to expose the brick beneath), with bright colors, and local artwork on the walls. A back room separated from the seating area houses the roasters. It's more of a typical coffee shop, and less of a coffee bar. Good place, though. There were a couple of cafe tables out front, and limited seating inside. I'm guessing they've only got room for 25 or so folks, and if they really did have that many, it'd be crowded and loud. But the weather was nice, and they also have a really big outdoor seating area in the back that easily doubles their capacity. We sat out back, and it was quiet and breezy. They only had three coffees ready-to-go, but cheerfully offered to make me a pour-over of the coffee I really wanted to try - the cheekily-named Obama blend. 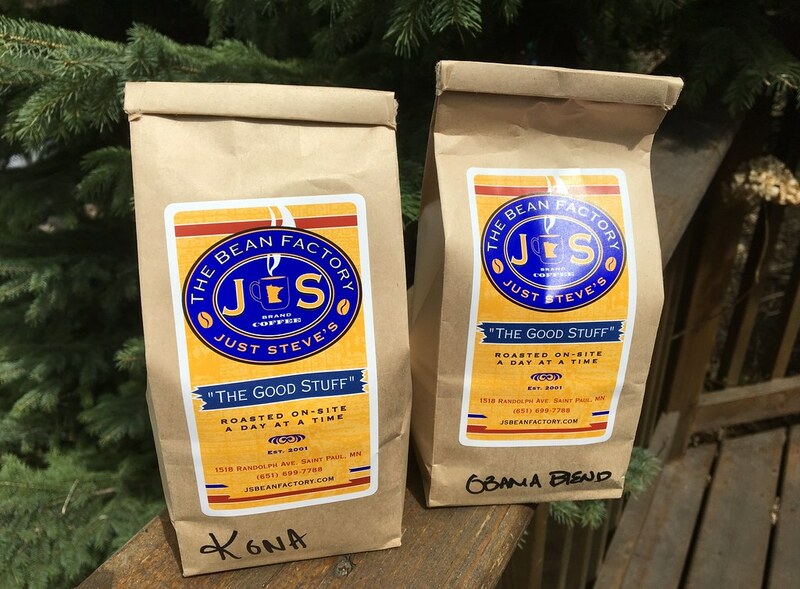 Created when President Obama took office, it's a blend of Hawaiian Kona and Kenyan AA beans. The coffee shop seems to specialize in medium and dark roasts - when perusing their coffee bean selections, I noticed that none were light roasts, and their website seems to support that. I tend to not like dark roasts, but the occasional medium roast can be yummy, so I figured they'd have something to suit me (and the Obama blend was quite good). One thing I really liked - they had the usual branded mugs for sale, but also sold hand-made mugs made by local potters as well. They sold a very modest selection of coffee equipment (one grinder, and one cold-brewer), and several nice sweatshirts and T-shirts. I figure I'll always try two drinks when I go to a coffee shop - a cup of coffee that I'll drink black if it's good (and with cream and sugar if not), and a latte for my daughter. It was quite good, very frothy, and the espresso was surprisingly smooth, and less bitter than many. I tasted it without sugar, and again after my daughter sweetened it. It was a very creditable latte. 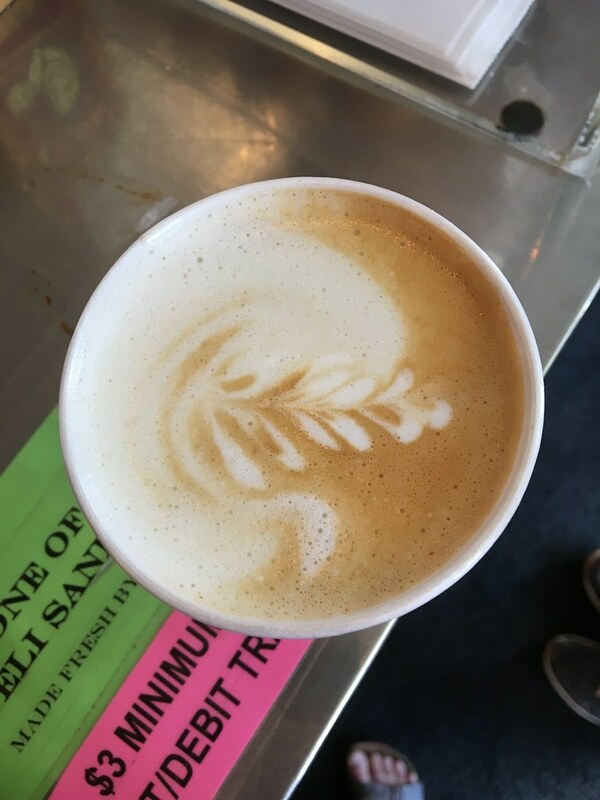 And I love the milk froth art. I had a pour-over of their Obama blend. It was a good coffee, very fruity, and to their very great credit, it wasn't too strong - rather it was just right. I find that many coffee shops brew with too much coffee, resulting in an overly strong, concentrated cup. This tasted like I had brewed it myself. My daughter brought her friend Michaela along, and since M isn't a coffee-drinker, I got her a cup of hot chocolate. The hot chocolate was nothing special - obviously just on the menu for the kids that accompanied parents into the place. We ordered veggie tamales and a donut to share, and the tamales were great. When we were ordering the tamales, I described them to the girls as "corn mush surrounding some yummies on the inside," which caused one of the baristas to crack up: "That's totally what tamales are!" We dropped one of the tamales on our way outside, and a white-haired guy (the owner?) got us another one, which was awfully nice, since it was totally our fault. No one would accuse them of being apolitical. Coffee shops have a long tangled history of political unrest. As I drank my coffee, I looked around the outdoor seating area, and noticed that many patrons were sipping from J&S mugs, while I had a disposable cup. I realized that they were regulars who brought their own mugs. That's always a good sign, when it's obvious that they've got folks who meet there regularly. After checking the roast dates, I bought a half-pound each of the Kona coffee, and the Obama blend. I'll review those separately after I've brewed them a few times.